3 ingredient Pancakes - simply & healthy vegan recipes that taste amazing! Sometimes when I am cravling for pancakes I make these easy and delicious pancakes, because it takes only a few minutes! Have a try, you won´t regret it! These are made with only 3 ingredients! And are filled with protein from the aquafaba. Mix well and let it set for about 15 minutes. Add 1-3 tbsp of the dough in the pan for one pancake. Top with fresh berries, banana and a sweet blue cream made of Blue Magic,coconut cream and maple syrup. Dann 1-3 große EL Teig in eine auf mittlere Hitze erhitzte (mit 1/2 EL Kokosöl), beschichtete Pfanne geben. 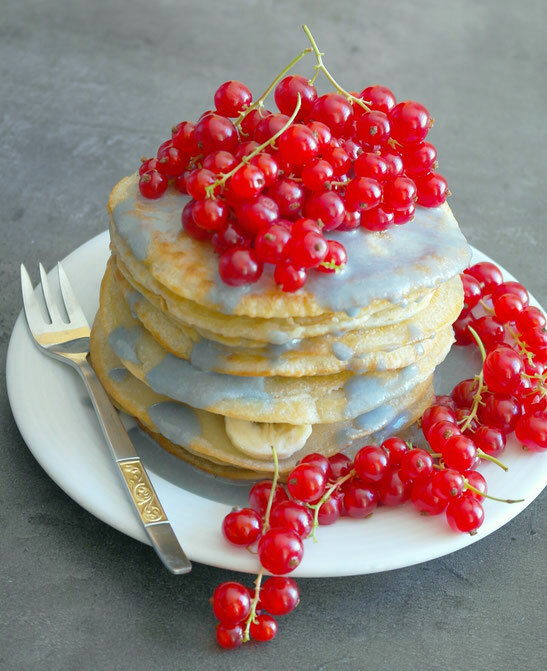 Mit frischen Beeren, Banane und Blue Magic Soße (Kokos Creme und Ahorn Sirup) toppen. Leave a comment - I love to get your feedback about this recipe!